Bishoujo Senshi Sailor Moon is one of the most popular Magical Girl anime of all time. It began its run in 1992, and on February 8, 1997, the series finally came to an end with episode #200. Each year’s series has a slightly different name. The first season is called simply “Sailor Moon”. 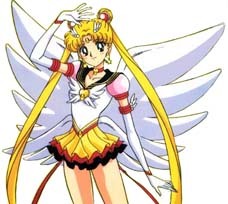 This was followed by “Sailor Moon R” (The R standing for “Romance”) , next came “Sailor Moon S”, in which the S was for “Super” (Usagi gets her Super Sailor Moon transformation), The next season was “Sailor Moon SS”, (SS= SuperS, the first few episodes of this series used a ‘Sailor Moon SS’ logo in the opening animation, but this was later changed to a ‘Sailor Moon SuperS’ logo. In SS, both Usagi and Chibi-Usa get Super Sailor transformations). Finally there is Bishoujo Senshi Sailor Moon, Sailor Stars, which is usually just called ‘Sailor Stars’. This page contains some basic story/plot background info that might be spoilers for those unfamiliar with the series. The story of Sailor Moon revolves around the main character, Tsukino Usagi, who, at the beginning of the first season is a 14 year old junior high student. 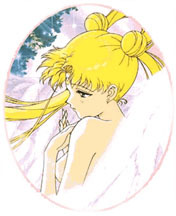 Usagi is a typical teenage girl: very cheerful, funny, and clumsy. She loves to eat, and to go shopping. Like many magical girls. Usagi is given her magical items by someone. In Usagi’s case, it was Luna, her talking pet that gave Usagi her transformation brooch. By shouting “Moon prism power, make-up!” and holding onto the brooch, Usagi can transform into Sailor Moon, a lovely soldier senshi. The exact phrase she shouts in order to transform changes throughout the series, as does her costume and transformation sequence. Her name also changes slightly. Furthermore, Usagi gets many different magical items that replace the original brooch (great for toy sales). Over the years she also becomes known asSuper Sailor Moon and Eternal Sailor Moon. According to Luna, there was a majestic kingdom on the moon a great many years ago, called the Silver Millenium. The kingdom was a happy place, ruled by the beautiful Queen Serenity and her equally beautiful daughter. The daughter, Princess Serenity, falls in love with a prince of the Earth named Endimyion. Unfortunately the young couple has little time together, for the Moon is soon invaded by the evil Dark Kingdom, led by Queen Metallia and Queen Beryl. 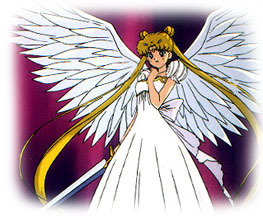 The battle is fierce, killing the peple of the moon, Endimyion, Princess Serenity, and the 4 sailor Senshi warriors who are her personal guard. Using the last of her life powers, Queen serenity invokes the power of the ginzishou, an incredibly powerful silver crystal. With her dying breath, Queen Serenity sends the forces of the Dark Kingdom away, and sends the dead Endimyion, Serenity, and the senshi to Earth, to be reincarnated in the future. Years later, in our present, the former members of the Moon Kingdom are once again reunited to fight Beryl, who has regained her strength, and attempts to take over the world. 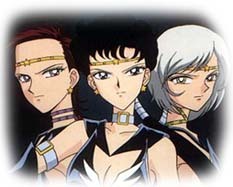 Not only do they fight Beryl, but a host of other villians as well, including the siblings Ail and Ann (characters that appear in the anime only, Naoko Takeuchi did not create them), the evil Wiseman, professor Tomoe, the Witches 5, Zirconia and the amazon trio and quartet, Nephrenia (also sometimes spelled Neherenia), and Galaxia/Chaos. In the three Sailor Moon movies, the senshi confront Fiore and his powerful flower, an evil Ice Queen, and Vadiane. There are a total of 14 Sailor Senshi in all: Sailor Moon, Sailor Mercury, Sailor Mars, Sailor Jupiter, Sailor Venus (who was popular as “Sailor V” in her own right), Sailor Pluto, Sailor Neptune, Sailor Uranus, Sailor Chibi-Moon, Sailor Saturn, Sailor Starfighter, Sailor Starmaker, Sailor Starhealer, and Sailor Chibi Chibi Moon. That is a lot of senshi! The Sailor Moon manga was written and drawn by a young woman named Naoko Takeuchi. The serialized installments of the manga ran in the larger ‘phonebook’ type girls manga called ‘Nakayoshi’. Kodansha publishes the manga compilations into tankoubon volumes. Sailor Moon was released in an English dubbed version in North America in the fall of 1995 by DIC. The storyline remained basically the same, but character names were changed, and the dialog was changed a lot. New music was created as well. The series received exceptional ratings in Canada, and has gained much popularity over there. In the US, a combination of factors led to a lukewarm performance in the highly competitive syndication market. Personally, I kinda liked the North American Sailor Moon. I watched it every day and taped all of the episodes. However I tend to treat it as a novelty, and my real Sailor Moon appreciation is for the original Japanese version. In 1997, the Sailor Moon manga was released in North America as one of 4 manga titles in a manga compilation called the Mixxzine. In 2000, Pioneer began releasing the Sailor Moon movies on DVD and new dubbed episodes of Sailor Moon S began airing on Cartoon Network. Sailor Moon is © Takeuchi Naoko, Toei Douga, TV Asahi, Kodansha.